Gapers Block - To be Demolished: 814 W. 58th St. Permit Description: Wreck and remove 2 story brick building. Demolition of this former home of One Stop Radiator Service had already begun when I arrived, but the unusual façade was still in tact behind the protective fence. Two of the demolition workers expressed surprise that the building was being demolished. They remarked "the city probably just got sick of it." "They think it's a nuisance ... There's nothing wrong with it. It's got good bones." 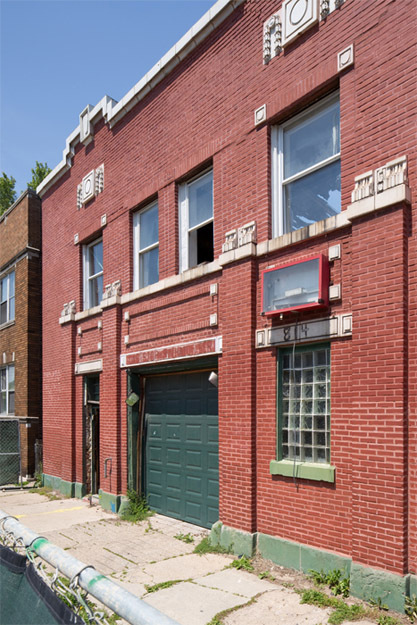 Two recent 311 calls cited the building as open and vacant on March 14 and May 6, but the building was otherwise absent from the 311 system.